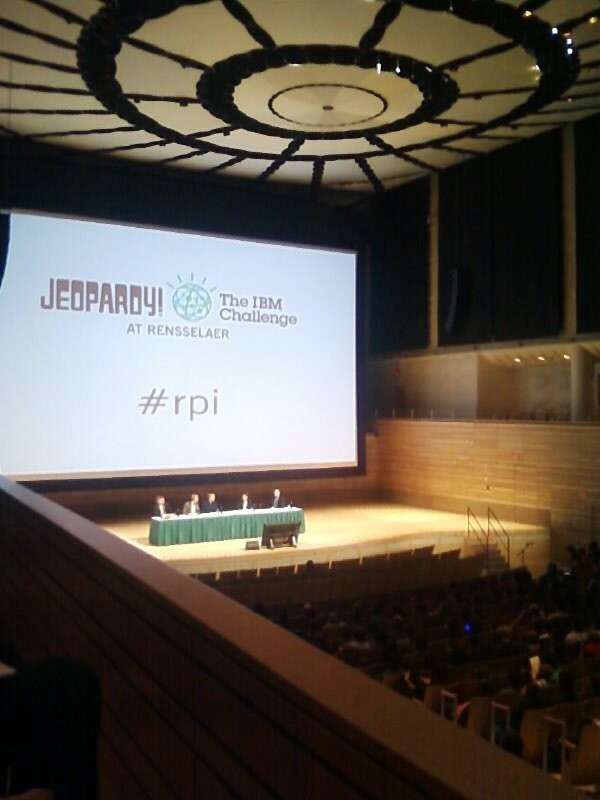 Watching the final night of the IBM Jeopardy! Challenge at EMPAC with over 800 students, alumni, faculty, and other guests Wednesday, I couldn’t help but think about what a student here said to me last year. We were talking about why she was involved in a rather challenging student club activity that involved designing a small airplane from scratch, and then flying it via remote control to prepare for a national competition. Her answer was pretty simple: The project allowed complex formulas in engineering textbooks to come alive. The same thought occurred to me as I watched most of the students on all three nights root for IBM’s fabulous Watson computer. Not only were they witnessing the best computer science has to offer spring from textbook pages onto the TV screen, but in the person of IBMers Chris Welty and Adam Lally they caught a glimpse of just where their Rensselaer education could take them. (As a parent of a Rensselaer grad, I already know.) You might have read elsewhere on this site and in the news that Welty and Lally earned their degrees at Rensselaer. They went on to work on the research team at IBM and were fortunate enough to work on the group that developed Watson over the last four years. The lead scientist on the project, David Ferrucci, also earned his doctorate here. As planning was underway for national broadcast of the three-night competition, Welty and Lally agreed to spend time with us here during the national broadcast, and share their recollections about Watson’s development and provide glimpses of future roles for Watson-like computers during viewing parties at EMPAC. They were joined each night by faculty members and Institute leaders from Rensselaer who helped advance our understanding of computers like Watson. Based on the reactions from students, the time invested by the IBMers and our professors will go a long way toward helping them understand and navigate their education today and what the world holds in store for them following commencement. I’ll admit I was surprised at first when students erupted in applause as Watson surged into the lead during the first night. Wasn’t there any sympathy for the poor humans who couldn’t seem to match Watson’s swift buzzer skills? As that night and the following two unfolded, I began to understand that many of them were rooting for proof that, when properly harnessed and programmed, the technologies they were studying could do something no one had ever seen. And unless you’ve been living under a rock, you know that despite the infamous “Toronto?” answer in Final Jeopardy on the second night and a late push by Jennings, Watson rode off into the sunset a big winner. A warm tip of the hat goes to Chris Welty and Adam Lally for spending time with our students here in Troy. I can’t help but think about what might emerge next from that IBM lab downstate. And, you might be wondering, whatever happened to the student flying club I spoke with last year? They did pretty well, finishing ninth out of 69 college teams from across the country last May. And they handily beat some well-known science and technology schools, including one with well-known initials to the east. See some great photos of the team and competition here.